Planet X, Nibiru Was Big News and it Vanished From the Media for more than 25 years! New Evidence says it is Real! If you remember there was a rash of articles in mainstream publications about Planet X, Nibiru in the 1980, this seemed to be the science news in vogue at the time. Where did these stories go, what exactly happen to Planet Nirbiru that the experts were very sure was out there. This post revisits some of those original stories. New evidence just released in the last few days suggest that there is a planet skirting the edges of the solar system that is four times the size of earth. It is too distant to be easily spotted but it is tugging on other planets which explains their strange wobbles. This information was recently presented by Rodney Gomes, (a noted astronomer at the National Observatory in Brazil) at a meeting of the American Astronomical Society in Timberline Lodge, Oregon earlier this month. The Astronomers all agreed that the data being presented so far is extremely compelling but more evidence is needed before they can say this planet is real. When scientists noticed that Uranus wasn't following its predicted orbit for example, they didn't question their theories. Instead they blamed the anomalies on an as yet unseen planet and, sure enough, Neptune was discovered in 1846. Now astronomers are using the same strategy to explain quirks in the orbits of Uranus and Neptune. According to John Anderson of the Jet Propulsion Laboratory in Pasadena, Calif., this odd behavior suggests that the sun has an unseen companion, a dark star gravitationally bound to it but billions of miles away. ... Other scientists suggest that the most likely cause of the orbital snags is a tenth planet 4 to 7 billion miles beyond Neptune. A companion star would tug the outer planets, not just Uranus and Neptune, says Thomas Van Flandern of the U.S Naval Observatory. And where he admits a tenth planet is possible, but argues that it would have to be so big - a least the size of Uranus - that it should have been discovered by now. To resolve the question, NASA is staying tuned to Pioneer 10 and 11, the planetary probes that are flying through the dim reaches of the solar system on opposite sides of the sun. Astronomers are readying telescopes to probe the outer reaches of our solar system for an elusive planet much larger than Earth. Its existence would explain a 160-year-old mystery. ... The pull exerted by its gravity would account for a wobble in Uranus' orbit that was first detected in 1821 by a French astronomer, Alexis Bouvard. Beyond Pluto, in the cold, dark regions of space, may lie an undiscovered tenth planet two to five times the size of Earth. Astronomers at the U.S. Naval Observatory (USNO) are using a powerful computer to identify the best target zones, and a telescopic search will follow soon after. ... Van Flandern thinks the tenth planet may be between two and five Earth masses and lie 50 to 100 astronomical units (4.6 Billion-9.3 Billion Miles) -from the Sun. His team also presumes that, like Pluto's, the plane of the undiscovered body's orbit is tilted with respect to that of most other planets, and that its path around the Sun is highly elliptical. A pair of American spacecraft may help scientists detect what could be a 10th planet or a giant object billions of miles away, the national Aeronautics and Space Administration said Thursday. Scientists at the space agency's Ames Research Center said the two spacecraft, Pioneer 10 and 11, which are already farther into space than any other man-made object, might add to knowledge of a mysterious object believed to be beyond the solar system's outermost known planets. The space agency said that persistent irregularities in the orbits of Uranus and Neptune "suggest some kind of mystery object is really there" with its distance depending on what it is. 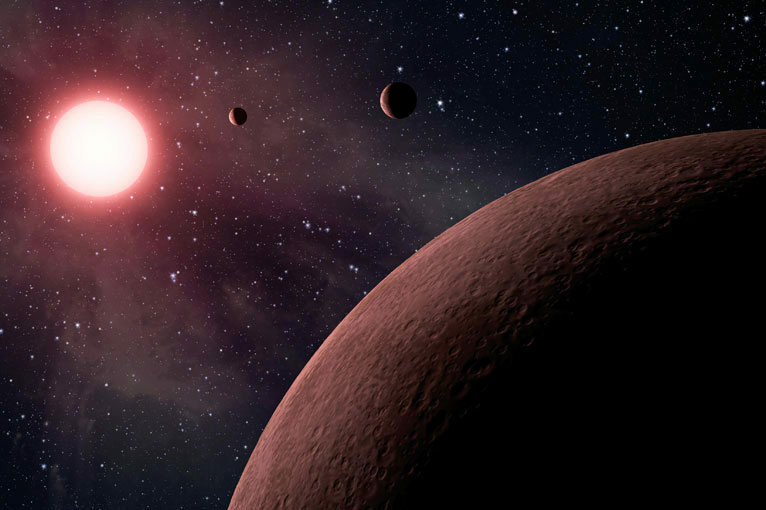 If the mystery object is a new planet, it may lie 5 billion miles beyond the outer orbital ringof known planets, the space agency said. If it is a dark star type of object, it may be 50 billion miles beyond the known planets; if it is a black hole, 100 billion miles. A black hole is a hypothetical body in space, believed to be a collapsed star so condensed that neither light nor matter can escape from its gravitational field. Shrouded from the sun's light, mysteriously tugging at the orbits of Uranus and Neptune, is an unseen force that astronomers suspect may be Planet X - a 10th resident of the Earth's celestial neighborhood. Last year, the infrared astronomical satellite (IRAS), circling in a polar orbit 560 miles from the Earth, detected heat from an object about 50 billion miles away that is now the subject of intense speculation. "All I can say is that we don't know what it is yet," says Gerry Neugesbeuer, director of the Palomar Observatory for the California Institute of Technology. Scientists are hopeful that the one-way journeys of the Pioneer 10 and 11 space probes may help to locate the nameless body. The hunt for new worlds hasn't ended. Both Uranus and Neptune follow irregular paths that observers can explain only by assuming the presence of an unknown body whose gravity tugs at the two planets. Astronomers originally though Pluto might be the body perturbing its neighbors, but the combined mass of Pluto and its moon, Charon, is too small for such a role. ... While astronomers believe that something is out there, they aren't sure what it is. Three possibilities stand out: First, the object could be a planet - but any world large and close enough to affect the orbits of Uranus and Neptune should already have been spotted. Searchers might have missed the planet, though, if it's unusually dark or has an odd orbit. NASA has been recording velocities for a year now and will continue for as long as necessary. This past spring, it appeared that budget cuts might force the end of the Pioneer project. The space agency now believes that it will have the money to continue mission operations. Next year, the JPL group will begin analyzing the data. By the time the Pioneer experiment shows results, an Earth-orbiting infrared telescope may have discovered the body. ... Together, IRAS and the Pioneers will allow astronomers to mount a comprehensive search for new solar system members. The two deep space probes should detect bodies near enough to disturb their trajectories and the orbits or Uranus and Neptune. IRAS should detect any large body in or near the solar system. Within the next year or two, astronomers may discover not one new world, but several. The most fascinating explanation of this mystery body, which is so cold it casts no light and has never been seen by optical telescopes on Earth or in space, is that it is a giant gaseous planet as large as Jupiter and as close to Earth as 50 billion miles. While that may seem like a great distance in earthbound terms, it is a stone's throw in cosmological terms, so close in fact that it would be the nearest heavenly body to Earth beyond the outermost planet Pluto. "This suggests it's not a comet because a comet would not be as large as the one we've observed and a comet would probably have moved," Houck said. "A planet may have moved if it were as close as 50 billion miles but it could still be a more distant planet and not have moved in six months time." When IRAS scientists first saw the mystery body and calculated that it could be as close as 50 billion miles, there was some speculation that it might be moving toward Earth. "It's not incoming mail," Cal Tech's Neugebauer said. "I want to douse that idea with as much cold water as I can." Then, what is it? What if it is as large as Jupiter and so close to the sun it would be part of the solar system? Conceivably, it could be the 10th planet astronomers have searched for in vain. It also might be a Jupiter-like star that started out to become a star eons ago but never got hot enough like the sun to become a star. While they cannot disprove that notion, Neugebauer and Houck are so bedeviled by it that they do not want to accept it. Neugebauer and Houck "hope" the mystery body is a distant galaxy either so young that its stars have not begun to shine or so surrounded by dust that its starlight cannot penetrate the shroud. "I believe it's one of these dark, young galaxies that we have never been able to observe before," Neugebauer said. "If it is, then it is a major step forward in our understanding of the size of the universe, how the universe formed and how it continues to form as time goes on." The next step in pinpointing what the mystery body is, Neuegebauer said, is to search for it with the world's largest optical telescopes. Already, the 100-inch diameter telescope at Cerro del Tololo in Chile has begun its search and the 200-inch telescope at Palomar Mountain in California has earmarked several nights next year to look for it. If the body is close enough and emits even a hint of light, the Palomar telescope should find it since the infrared satellite has pinpointed its position. Is Google Covering Up Nibiru, Many think so.